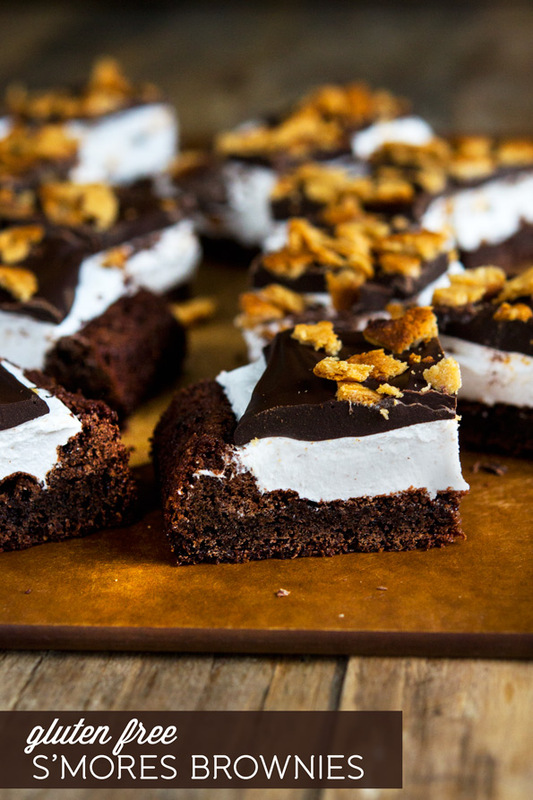 Gluten Free S'mores Brownies | Great gluten free recipes for every occasion. [pinit]We’ve talked about gluten free s’mores before, but not for a while. You see, I adore the flavor combo of s’mores, but I’m just not that excited about biting into something that, well, doesn’t want to be bitten. Your basic s’mores do not want to be bitten. Even when the marshmallows and chocolate are all melty and gorgeous, the graham crackers have other ideas. But summer’s here, and s’mores are an essential part of it. I think you know where I’m going with this. Yes? S’mores brownies do not suffer from this sort of biting resistance. 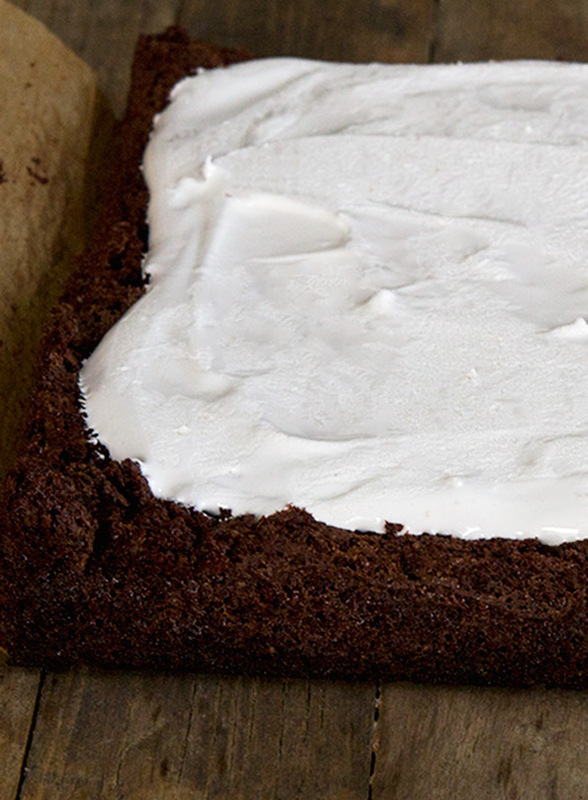 The soft brownie layer was clearly made for biting (big news). Homemade gluten free (corn free!) marshmallows are easy to slice, and blow commercial marshmallows right out of the water. Plus they’re seriously fun to make. Just a few basic ingredients, and they triple in size, right before your very eyes. Make them once, and you’ll be looking for excuses to make them again. I don’t think I’ll ever buy commercial marshmallows again. Preheat your oven to 350°F. Grease the bottom of a 9-inch square baking pan and line it with unbleached parchment paper that overhangs two opposite sides of the pan. Grease the paper, then place another, crisscrossed sheet of parchment paper on top that overhangs the other two sides. Set the pan aside. Make the brownie layer. In a large bowl, place the flour blend, xanthan gum, baking powder, baking soda, salt, cocoa powder and sugar, and whisk to combine well. Add the butter, egg and egg yolk, and vanilla, and mix well. Spread the batter evenly in the prepared pan and tap on the counter to break any trapped air bubbles. Place the pan in the center of the oven and bake for 22 to 25 minutes, or until a toothpick inserted in the center comes out with, at most, a few moist crumbs attached. Allow to cool completely in the pan (if you’re impatient like I am, after a few minutes stick it in the freezer). Make the marshmallow layer. In a small bowl, place the gelatin and 1/4 cup (2 fluid ounces) water and mix to combine well. Set the bowl aside and allow the gelatin to swell as it stands. Once the gelatin has swelled, transfer it to the bowl of a stand mixer (or a large bowl to use with a hand mixer). In a medium, heavy-bottom saucepan, place the remaining 1/4 cup (2 fluid ounces) water, sugar and cream of tartar, and whisk to combine well. Cook the sugar mixture over medium-high heat until it reaches the softball stage, between 238°F and 240°F, on an instant read thermometer. Remove the saucepan from the heat immediately, and pour the cooked sugar mixture down the side of the bowl of the stand mixer into the gelatin mixture. Whisk to combine and allow the mixture to cool briefly. It will bubble. Add the vanilla and salt, and beat the mixture on medium-high speed with the whisk attachment (or with a hand mixer) until the mixture is white, thick and glossy. It should nearly triple in size. It is ready when the mixture pours off the whisk (or beaters) very slowly when the attachment is raised. Scrape the marshmallow mixture onto the chilled brownies, and spread into an even layer. Place in the refrigerator until set (about 3 hours). Once the marshmallow layer is set, remove the brownies from the pan by lifting up on the overhung pieces of parchment paper. Melt the chocolate in a small heat-safe bowl over a double boiler (or in the microwave on 70% power in 30 second intervals) until smooth. Pour the melted chocolate in an even layer over the top of the marshmallows, and immediately sprinkle the graham cracker crumbs over the top. Allow to sit until the chocolate sets. Slice into 16 squares with a large, serrated knife before serving. The chocolate layer will crack somewhat unevenly. Brownie layer adapted from the Make-Your-Own Brownie Mix on page 199 of Gluten-Free on a Shoestring Quick & Easy: 100 Recipes for the Food You Love–Fast! (Da Capo 2012). P.S. If you haven’t yet, please pick up your copy of the Gluten-Free on a Shoestring cookbooks! Thank you so much for your support, which keeps the blog humming along! Made these today…wonderful!! Even got out the first cookbook and made the graham crackers for the first time! Yum! Have you ever used kosher or halal gelatin to make the marshmallow or as someone else posted, pectin? Thanks for a tasty Sunday! Vegetarian, Gluten-Free Roundup: Enjoy the long weekend! Stumbling Over Chaos :: REALLY can’t linkity for long – packing! Thanks for the recipe, looks YUM. Could the marshmallow be made with pectin for vegetarians? Do you know if these would turn out ok using Truvia instead of the sugar? I made these, but just the brownie part (for now). OMG! Are these ever awesome brownies. We have been eating grain-free for a while, which has been hard on my 10 year old daughter. She’s been wanting brownies, she LOVED them! I am not holding fast and hard to no grains with the use of gluten free flour as it has rice flour in it, but oh well. 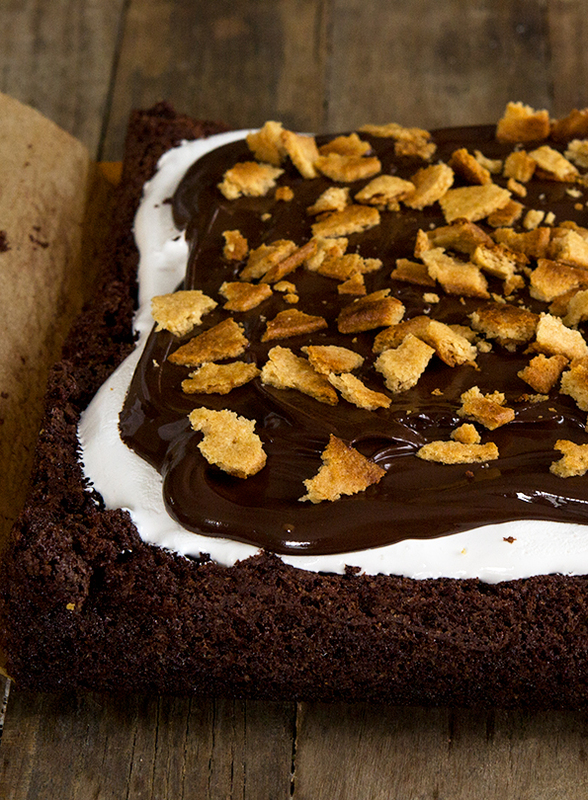 I’m going to make your chocolate graham crackers and do the s’mores brownies for our block party on the 4th of July. Thanks! I hate you, no I love you, no I hate you, YES! I LOVE YOU! I have been seeing these buggers all over pinterest and dying for them. Yours are the best looking yet! I also have my thermometer that I found at BB&B and I just ordered some schar grahams that came all broken. : ( so I can’t make my traditional s’mores treat very well (though I am managing) but they’ll work fabulously in this recipe!!!! Totally making this for 4th of July along with the jigglers for the kids. YAHOO! Yes, they are – sorry! I’m so glad that you came to my rescue though and made them gluten free….. I really truly am going to make your graham recipe now that I can’t get Schar to me without them being completely broken. I just have to plan it out and fit it in here… after I’m done with my last shipment. Thanks again for your brilliant recipe! I would have to agree with you there. 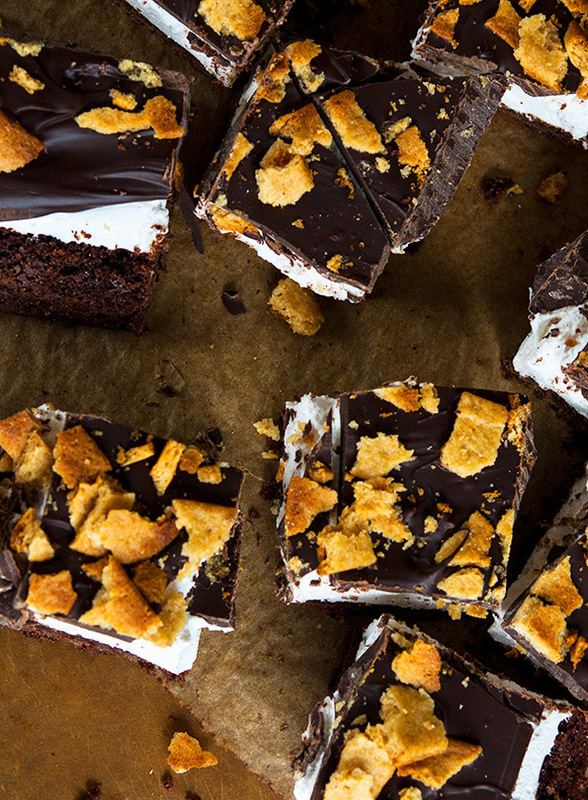 You’re homemade decadent brownie, fluffy marshmallows, crackled chocolate, and from scratch grahams are far beyond any other recipe my friend. And you know I always come here for my GF recipes first!!! :) Visiting here is only second to checking my email!!! YUM. May I suggest you give that marshy marshy marshmallow a pass or two with a kitchen torch to give it some toasty goodness before layering on the chocolate for even more Smores-OOMph! <3 Thanks for your great blog!